Positive Approach to Dementia Care: Teepa's new DVD, "In-Home Dementia Care: Tips & Techniques"
Teepa's new DVD, "In-Home Dementia Care: Tips & Techniques"
Teepa Snow has a new DVD for home caregivers, "In-Home Dementia Care: Tips & Techniques." Caring for your loved one living with a form of dementia in the home setting can create challenges those on the outside can only imagine. Without a strong support system and hands-on skills, this very difficult job can easily leave caregivers feeling stressed, overwhelmed, and isolated. Would you like to know how to build a care environment that best balances your loved one's needs with your own well-being and abilities? 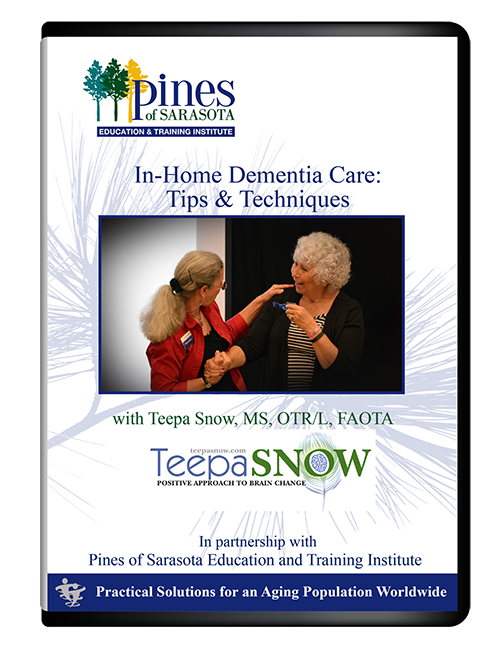 Check out Teepa's new DVD, "In-Home Dementia Care: Tips & Techniques."